Regular readers of this website will no doubt be familiar with the ‘Official Swansea City Quiz Book Volume 1’ that we reviewed earlier this season. Well for those of you looking for the perfect stocking filler for any Swansea City fan this Christmas, you’ll be pleased to hear that the ‘Official Swansea City Quiz Book Volume 2’ has now hit the shelves. This 154 page quiz book builds on the impressive selection of quizzes from the debut book and will once again test even the most ardent Swans fan. Volume 2 includes 75 quizzes which cover the entire 102 history of the Swans and include some amazing facts, figures and picture quizzes to test your Swansea City knowledge. The book is made all the more enjoyable as all of the quizzes are supported by more facts and figures – so you get to learn as well as test your knowledge of the Swans history at the same time. Now that’s what you call a challenge! Do you think you know all there is to know about Swansea managers, Swans legends (old and new), top scorers, Welsh internationals and Swans loan players? Well whether you do or don’t, you’ll have hours of fun testing yourself or tormenting your friends and family with these Swans related quizzes. I thought the first book was a hard act to follow but the second in the series of official club quiz books doesn’t disappoint and regardless of how long you have supported Wales’ Premier League football team you’ll enjoy this fun and fascinating book. Whilst having a go at the various quizzes, I found myself harking back to seasons gone by and remembering players (some good and some awful! ), particular games and more often than not the bad times in the lower divisions!! But with quizzes on our Premier League campaigns to date included in the book as well, a nice balance has been reached between the past and the present. 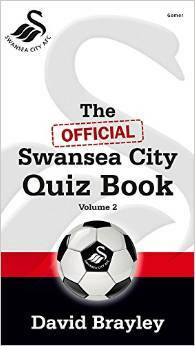 “The Official Swansea City Quiz Book Volume 2” is available from the Swans Superstore, Gomer Press and other leading book retailers such as Amazon. Priced at £6.99 the book offers exceptional value and will provide an ideal gift for any Swans fan this Christmas. So will you be the Swans quiz champion in your house this Christmas?